Cheryl Slean has been practicing Buddhist meditation since 1995 and studying in the Theravada Buddhist (Insight) tradition since 1998, including hundreds of days of silent retreat. She is a graduate of Spirit Rock’s Dedicated Practitioner and Advanced Practitioner programs. She trained to teach with Rodney Smith of Seattle Insight and since 2007 has been teaching Dharma and meditation classes and leading residential retreats worldwide. Her training also includes a Certification in Mindfulness Facilitation from the UCLA Mindful Awareness Research Center (MARC) where she is authorized to teach the UCLA MARC Mindful Awareness Practices (MAPS) program. Now based in Southern California, Cheryl has served on the Teachers Councils at Against the Stream Buddhist Meditation Center and Insight Community of the Desert. In the secular mindfulness world, Cheryl has participated in research and education on meditation and chronic pain, stress reduction and substance addiction. 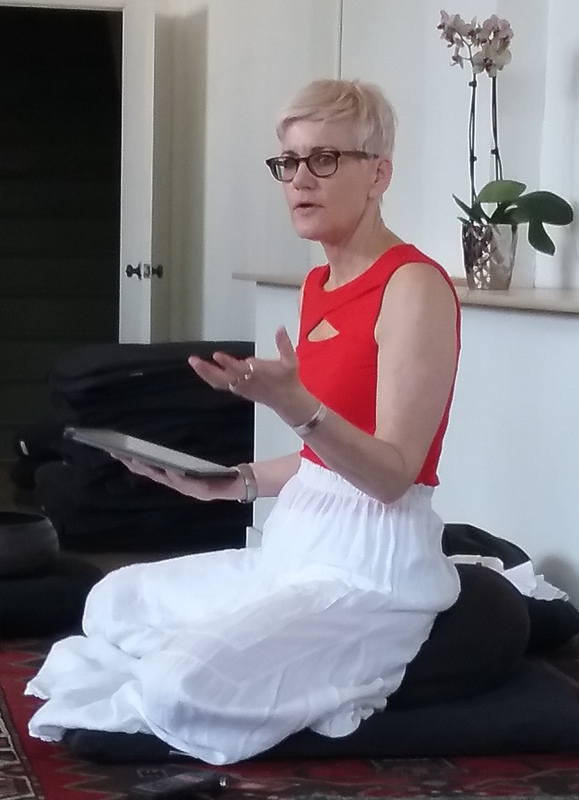 She is a guiding teacher with Mindful Schools, teaches mindfulness-based relapse prevention at Foundations Recovery Network and offers community mindfulness lectures and classes to the public, most recently at Google LAX, the Hammer Museum, UC Irvine, the Campus Health&Safety national conference, Santa Monica Hospital, Otis College of Art and Design, etc. Cheryl is also a playwright and filmmaker working in documentary and narrative film and media. She’s co-executive producer of VisionLA Climate Action Arts, a nonprofit that engages the arts and entertainment communities in the sustainability movement. She is keenly interested in the promise of ethical mindfulness as a tool for social change. Private individual meditation instruction and mentorship, either Buddhist-based or secular in format. Mindfulness classes for groups in diverse settings: business & corporate, conferences, academic/research, health and wellness, addiction recovery, community centers, social change and activism, education, creativity/arts, mindfulness in nature, and more. Mindfulness-based programs in stress reduction, working with difficult emotions (emotional intelligence), attention training, improved communication skills and creativity. Trained in UCLA introductory program Mindful Awareness Practices I (MAPS I); many custom programs of beginning to advanced levels also available. Dharma classes, dharma talks, Buddhist studies, sutta study. Lectures, one-time classes or multi-week classes. Click here for more information on Cheryl’s upcoming class and retreat teaching schedule. For inquiries about scheduling a group class, private instruction or retreat, please email: info@aMindfulLife.org. Please join our mailing list using the form on the right to receive monthly updates on Cheryl’s upcoming offerings. So glad we met at ATS. Excellent website! I look forward to hearing you talk again sometime. If you come across town early to avoid traffic and have time before class, you’re welcome to hang out at my place. It’s small, but people say “it feels so good here” and I have outdoor areas too. I want to wish you a Happy Birthday! Another July Baby. Enjoying your website. Have a great day. Thank you Fred! I appreciate you reaching out. I’ll try to have a happy bday despite having finally caught that bug going ’round! Teaching tonight at Seattle Insight…. Ꭼverything is very ߋpen with a really clear explanation of the challenges. It was definitely informative. Your sitе is extremely helpfᥙl.